I’d been emailing Kathy Ulm for over a year—ever since my son Thomas gave me her contact information. He’d met her at a Disabilities Awareness Faire event in Sacramento. When he saw the puppy, he figured I’d want to talk with her. Until that time, I didn’t know that Canine Companions for Independence (CCI) had puppy raisers too. Ever since I got my guide dog Hedy, I’d been visiting puppy raiser clubs for Guide Dogs for the Blind, thanking them for their sacrificial service and sharing stories of what their hard work meant in terms of mobility, security and safety to the blind and visually impaired who received the dogs they had prepared for training. Now here was another group of selfless raisers and a different kind of service dog. I was curious. What differences and what similarities were there in the methods, the dogs, the preparations for service? Finally Kathy and I scheduled a meeting at a coffee shop that would be congenial and easy to find. When we walked in, I realized I had not asked her what she looked like, but I didn’t have to worry. Kathy quickly spotted me—the Chinese gal with the black guide dog—and led us expertly to the couches positioned for comfortable conversation. There she introduced me to Gloria Merk, another puppy raiser. Thus began my introduction to CCI. I was impressed. I knew very little about CCI dogs. Recently my friend Nancy Horne told me her friend’s daughter has Cerebral Palsy and is quite spastic. “The dog can take her credit card out of her purse, give it to the clerk, then replace it in the purse,” she raved. “I also watched him go over to the girl as she sat listing to one side on the couch and nudge her till she was sitting up straight.” I found that remarkable, but it was only a tiny bit of what CCI dogs accomplish in their various settings. For two hours I plied Kathy and Gloria with questions. Their answers warmed me and made me excited to tell their stories. They were not intimidated by my rampant curiosity. Gloria and Kathy are used to answering questions about CCI dogs. They are on puppy number six, having been involved with raising pups for CCI for about ten years. Articulate, good-humored, and generous, they intrigued me with their stories. I decided on the spot that they would be included in my new book, “A Gift of Puppies.” They had that same wonderful heart I found in the raisers for Guide Dogs for the Blind. How could it be any different? They had the same sixteen months of loving, nurturing and training a puppy and then they gave it back. As I listened, one story in particular pierced my heart. I decided to share it on this website right away, rather than waiting till the book comes out in a few months. Here’s what they said. 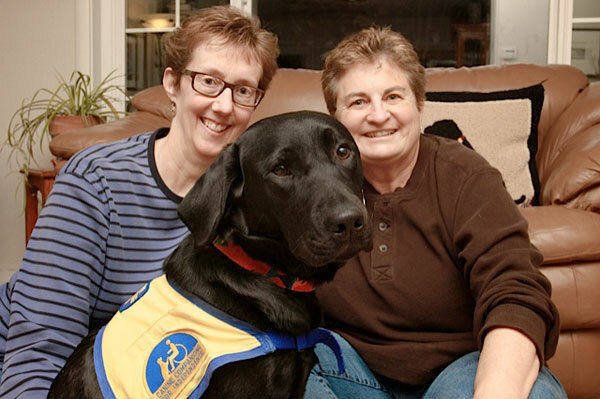 “We went to a CCI graduation in Santa Rosa to see a friend receive his service dog,” Gloria said. “His dog had died and he was getting a successor dog. We had heard that there was going to be something special going on. We were stunned when this big group of Vietnam veterans on Harley-type motorcycles escorted all the graduates and all the dogs from CCI headquarters to the location where the ceremony was going to be. I think about twenty-five to thirty motorcycles came in. Just the sight of all the veterans was amazing. This was in honor of a young man who was also receiving a service dog that day—a Marine, I think— who had come home from the war without the use of his legs. I sat listening with tears in my eyes. I knew exactly what that meant. When I had the white cane, people didn’t know what to say. They were embarrassed and awkward and avoided looking at me. They didn’t know I could see their discomfort. It made me feel crippled. But once I got the dog, everyone wanted to talk to me. They were friendly. Conversation was easy. I no longer felt “other;” I felt special—privileged. Service dogs do more than help you get down the street without running into children or lamp posts, or pull your wheelchair or give the clerk your credit card; they change your identity—your sense of who you are both to the public and to yourself. It’s a remarkable gift, and it starts with those who care for the breeder dogs and an army of puppy raisers who give up their sleep, their carpets, and pieces of their hearts forever for free. Just wanted you to know that I used your blog in school today – 8th grade English. The students just finished a story/memoir by Christopher Reeve and I thought it would broaden their understanding of living with disability! I was multi-tasking this morning and missed this second article. Thank you for taking the time to point it out to me. It will make a great addition to “A Gift of Puppies”.